Have you ever heard anything about “Khatam”? No? Well then, have you ever heard of Marquetry? Nah? Any bells ringin’? Well then, if you ever wondered “what is the meaning of two words I’ve never heard?” You are in the right place! I am here to answer all the questions you never had! No, seriously. If you were asked to do a research about Region-specific arts in each country, the huge pile of data you could gather would devastate you! It is just unbelievable how humans could come up with so many different kinds of arts and crafts. How creative can a specie get?! And what’s more, these arts have mostly begun like a thousand years ago! Those naked stone-aged people were definitely not as dumb as we thought. I’m surprised they didn’t manage to go to Mars or something. Anyway, so today I wanna introduce you to one of these region-specific arts! This one here is named “Khatam” or “Khatamkari”, and is a native Iranian art. It kinda resembles a collage; except instead of paper and cloth, you make it with bones, wood, wires and shells. From 17th century until now, Khatams have been made with the tiniest triangles glued together in geometrical shapes, and assembled on the surface decor pieces. Before 17th century, the base units were square instead of triangles. Yet after the Mongol invasion, Iranians got introduced to the Chinese inlay method, which was done with simple black and white triangles. That inspired Iranian artists, and they mixed up all they already knew with the Chinese method, leading them to create even better artworks that were neither this nor that. So Let’s get going! I’m gonna begin with the making process; but if you’re looking for something specific or you simply find another sections more interesting, feel free to use the table of contents below and navigate to any part you want! What Do They Even Make with Khatam? How Do They Make it? Where Do They Make This Stuff? How to Tell Good Khatam from a Bad One? Through the years, artists have made so many great Khatamkari artworks. Vases, picture frames, jewelry boxes, sugar bowls, wine pitchers and trays are still made and sold in and outside of Iran. 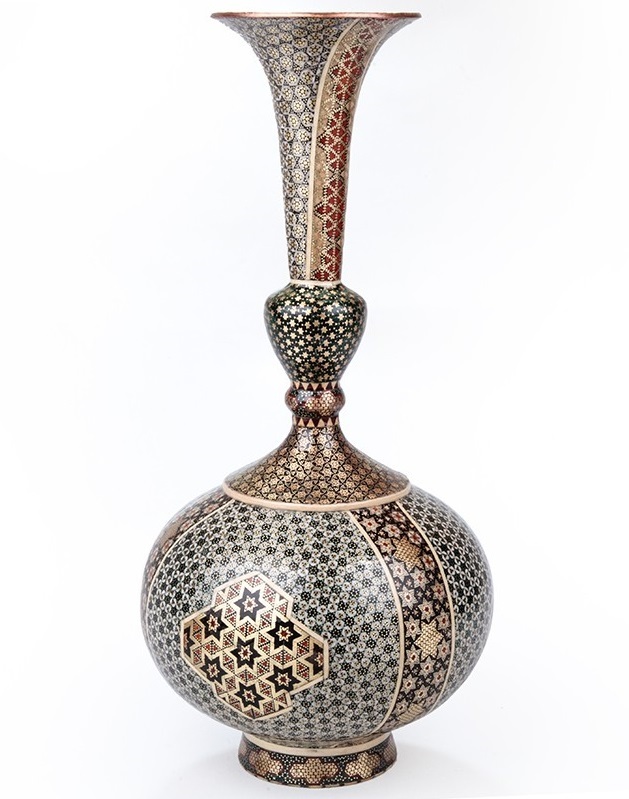 Khatam vase – if you like it, you can find it here. 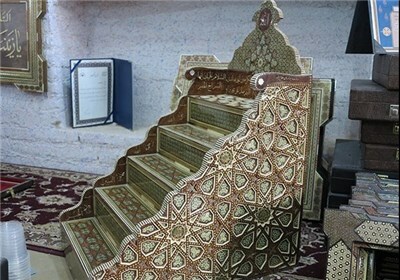 Here is a Minbar belonging to a mosque in Shiraz. Minbar is a special tribune you can see in any mosque, and it was quite an important part of it; that’s why the artists tried hard to decorate it in the best way they knew of. This Minbar has been here for a thousand years! 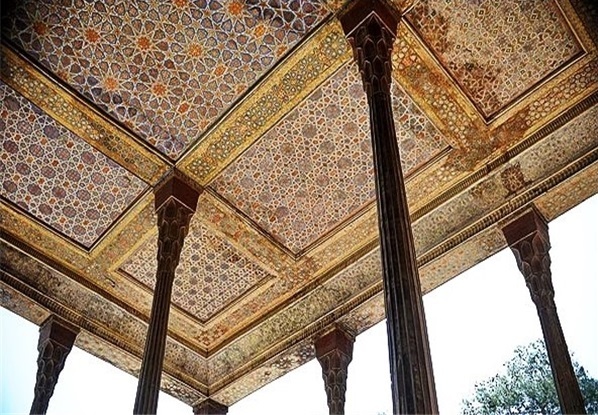 Some relentless masters even decorated a whole ceiling with Khatam! How Do They Make Khatam? Making a Khatam artwork begins with cutting wood and bone in long narrow pieces. These are the base materials of Khatamkari. And they are really slim! Grab a ruler and imagine a long line going up from between zero and the second tiny line that shows 2mm, That’s how slim each piece is! With 30 cm of length and 2 cm width, they are only 1-2.5 mm thick. It’s not easy to saw such small measures of wood, but cutting bones must probably be even harder. The solution is to soak the bones in limewater for some time in order to get them soft and bendable. As long as the bones are wet, they can be cut without much problem. Our ancestors were simple people. They were probably just desperate to be artists. I mean, they cut thousands of narrow pieces from bones! Ok, maybe they were really, REALLY bored! These branch-like wood pieces and bones now have to be shaped as triangular prisms. They are each placed in a mold-like board, which helps to get all pieces precisely sanded in the same size. Triangles are the smallest units in Khatamkari. Everything is made from triangles. Khatam is basically loads and loads of tiny triangles glued together. All our base materials should be shaped like this, and that’s what’s gonna happen to our third important material, wire. After we have all and everything “triangularized”, now we’ve got to make a pattern. The pattern is a geometrical drawing of how the final piece should look like. It’s a guide to see what shapes we should be making. So, to sum up, we’ve now got ourselves a bunch of triangular prisms made from wood, bone and wire. We also sketched our pattern. Let’s move on to the next step. Now this is the part that makes me stand up and applaud these tireless, diligent guys. They put four triangular prisms together and glue them to each other to form a bigger triangle. Each pair of these bigger triangles are again glued together, this time to create a diamond. From now on, the diamonds become the pieces of our puzzle. Khatamkars make so many shapes with them. From the five-pointed star above to hexagons, pentagons, octagons, decagons, and anything else with –agon at the end. Can you imagine how hard and laborious that can be!? To prevent the shapes we meticulously assembled from getting separated, each diamond we make has to be pressed tightly for at least 24 hours. Pressing also helps to fill the tiny gaps that might exist between two triangles. Every new assembly from diamonds must also go through this process. And when we finish it all, even our complete work is destined to endure an amount of pressure, so that we can make sure that everything is fixed well in place. When we finally manage to grow our piece in the desired size and form a final rectangle, it’s time to add Astar. Astar is a thin layer of wood, usually poplar, which is glued to the final shape in order to make it even more durable. Not every Khatam has an Astar, but the best Khatams always do. As you’ll see, it is one of the main signs of a good Khatam. If you were a good girl/boy and read up to here attentively, you probably noticed that we made triangular “prisms”, not triangles. It’s time we get to the actual triangles. All the prisms we glued together must now be cut in 1mm to 1.5 mm thickness. Each assembly that we cut makes 20 pieces. Basically we make our initial shapes with prisms, but when we cut them they turn into attached triangles. It’s time to bring on the decor piece we want to decorate. This is the fun part, it’s like you’re solving a puzzle! As you’ll read later, This is where Khatam, Marquetry and Intarsia start to become similar. 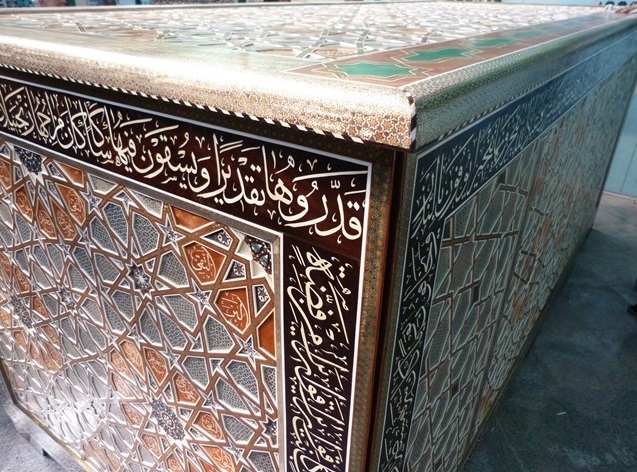 The surface of our Khatam must now be gently sanded in order to remove even minor roughness. This is very important for achieving a fine, high quality Khatam. We’ve reached the final step! The only thing left to do is to make the fabulous artwork look shiny and smooth! Oiling helps us achieve that, but it also seals Khatam, protects it from air, and increases its lifespan. We are all from the same origins, we Eurasians. We have similar languages, similar looks, and similar artistic tastes. That means that along with Khatamkari in Iran, there is also Marquetry, folk Lath art and Intarsia. I know for a fact that the Chinese have something similar, too. I’m sure no one copied from the other (it wasn’t that easy to travel back then, was it now?) and it’s amazing how a simple kind of woodwork managed to become this different in each country! Human mind is bizarrely creative, isn’t it? Back to different kinds. Let’s start with Marquetry. 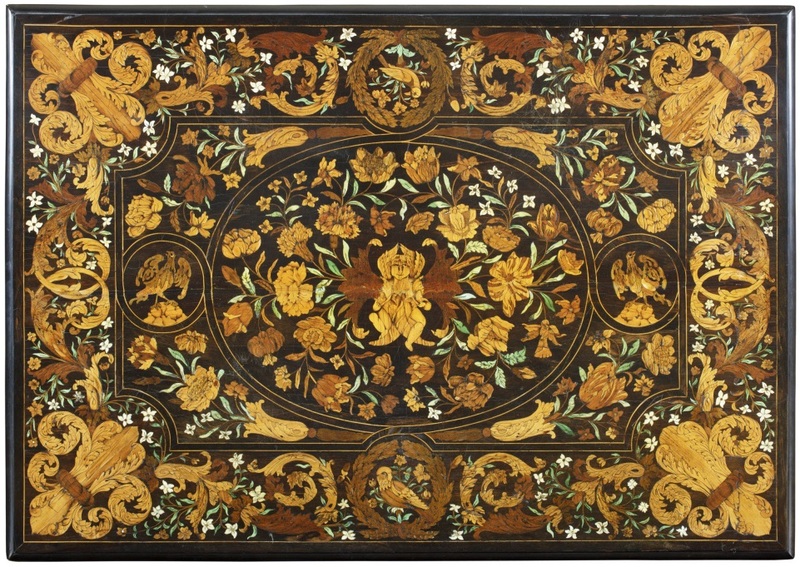 Marquetry or marqueterie is a picture or a geometric shape made with thin layers of wood (veneers). Veneers come in different kinds, which gives some variety of colors to choose from. First, you decide what kind of wood you want to use for each part of the picture, and then you cut that part from your veneer. 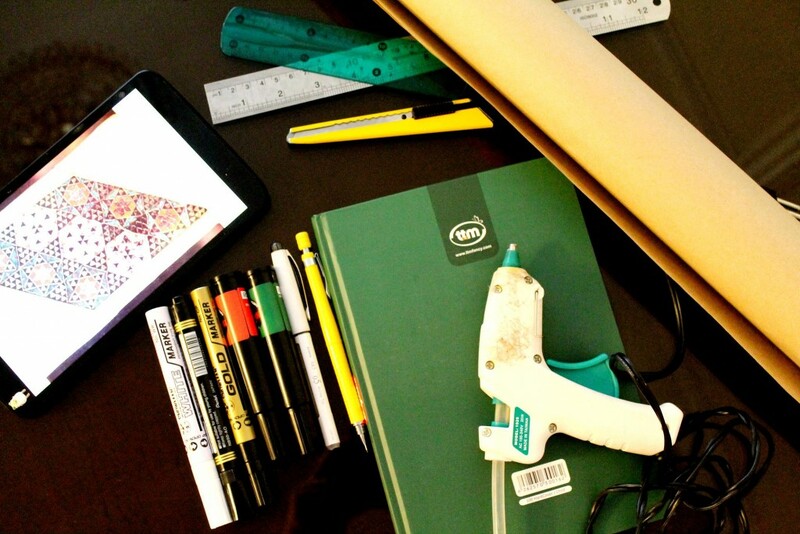 After all the cutting is over, you can start the fun process of assembling all pieces together and gluing them. It’s really like a jigsaw puzzle at the end. It is also like a 2D drawing; which means sanding it is quite important for getting rid of rough surface and achieving a smooth look. The rest of the making process is the same as Khatam; adding backboard, polishing, sanding, and oiling. 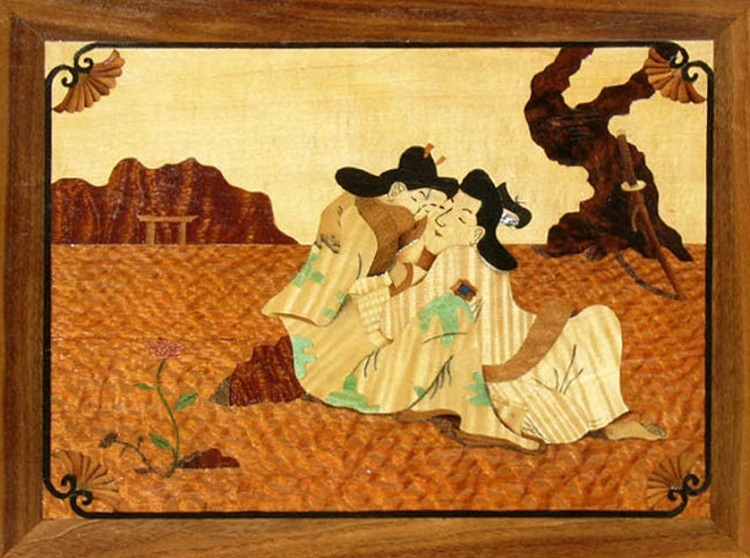 Intarsia is very similar to marquetry. In fact, they probably have the same process. Well how can you tell them apart? Take a look at the teddy intarsia below; you’ll notice that it is made with thicker layers of wood comparing to Marquetry. These fat pieces add a 3rd dimension of “depth” to the work. What’s more, picture marquetry usually has a rectangle frame which is not necessarily needed in intarsia, given its 3d look. 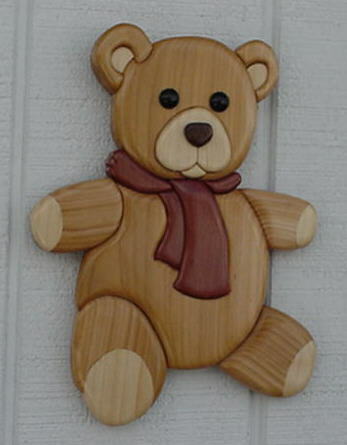 Teddy Intarsia – Image from Intarsia.net which btw contains a very detailed guide on intarsia making for beginners. Khatam, marquetry and intarsia, these arty jigsaw puzzles left to us from the ancient folk, are fairly similar but enormously different. They all begin with making a pattern or picture, which helps you create each part separately. You then montage the whole piece, and finally you go through sanding, polishing, and oiling. They also share the same main material which is wood. 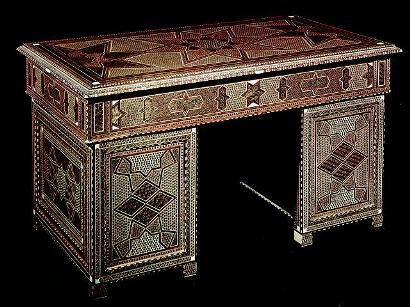 Marquetry and intarsia might also Include some bone, ivory, and shells. But khatam uses bones and even wires more sparingly; in fact they are its most important materials along with wood. Khatam also differs in the shape of its pieces; they aren’t just one layer of wood, but actually a combination of many smaller pieces. This makes khatamkari a longer and much harder process than marquetry or intarsia. Where Do They Make Khatam? In 16th-17th century (Safavid era), mostly the south cities of Iran were focused on Khatamkari, especially Esfahan, Shiraz and Kerman. After that, Khatam followed the kings wherever they went and basically got developed in capitals and important cities. That means Shiraz, Isfahan and Tehran; where still the main Khatam workshops of the country are busy at work. A Khatam gets its beauty from its carefully built geometric shapes. That’s the thumb rule. An asymmetric Khatam is no Khatam at all! The amount of work that was put into making a Khatam is also important. The more triangles you use the more precious work you create. The tinier the triangles are the more valuable a Khatam becomes. Make sure to notice if all parts of the surface are polished flat and evenly, and that there is no empty and undone space. Repairing shouldn’t be visible on the work. The oil coating should be smooth and flawless. A fine Khatam usually has Astar, which makes it more durable and If the Khatam is a quality one, it must have a wood Astar. Never buy a Khatam with a paper Astar! Ever! This one is a bit obvious, but a fine Khatam should have a quality glue. The usual glue in fine Khatam is isinglass. Though I don’t know any way that you can distinguish that; so you might have to just trust what the shopkeeper says! Ages ago, the best Khatam makers used natural colors to dye their base materials. Nowadays the chemical colors have found their way to Khatam workshops. Given that they’ve found their way to well, practically everywhere, using them in a Khatam doesn’t give it a bad name anymore. However, if you ever find a naturally dyed Khatam somewhere, make sure to get your hands on it before anyone else does! And finally, you need to know what materials were used to make this Khatam. Once again, you probably can’t make sure about this one! But if you encounter a reliable shopkeeper and he says his Khatams are made with Ebony, betel, walnut, logwood, jujube, orange, or aspen woods, you might feel more confident buying from him! Oh, and let’s not forget the wires. They’d better be of either brass, aluminum or silver. That’s all I had about khatam! I hope you enjoyed it and more importantly, I hope you found it useful. Now tell me, What do you think about Khatamkari? Do you like how it looks? How do you feel about the backbreaking process of making it? Do you think it’s worth it, or not? 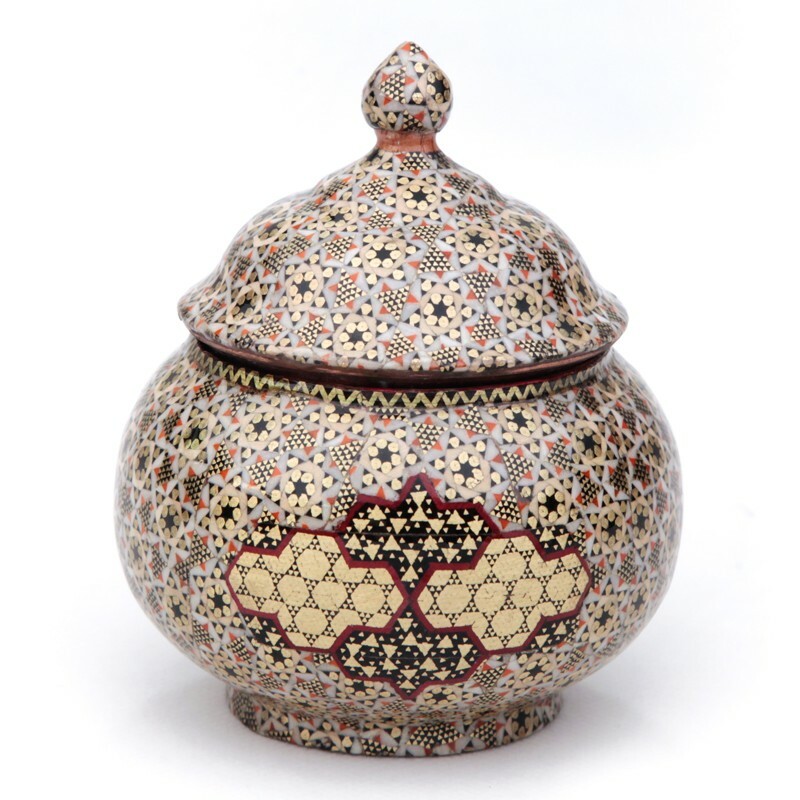 And while we’re on the subject, If Khatam has drawn your interest you might wanna take a look at some lovely khatam decor pieces we have on our website! Go check ’em out! Ebnabbasi, E., & Moqtadayi, A. (2014). Handicrafts and Their Evolution in Iran. Tehran, Iran: Jamale Honar.